I've always been a fan of eggs, in almost any form and I try to incorporate it in our daily diet to benefit from the protein factor in eggs. I've tried different variations of Egg curries and Egg biryanis. One such variation is what mom makes and something I had forgotten about completely until recently. Hubby doesn't like the smell of cooked/fried eggs so when he is around I usually make Egg Biryani with boiled eggs. It's when he is out of town and its just me and my little guy, out comes this flavorful recipe. This recipe is different in the fact that the ingredients are simple, and the eggs are scrambled and cooked along with the rice in a pressure cooker. This allows each grain of rice to take on the nice 'eggy' flavour. At first look this may seem like its Egg Fried rice but wait until you've tasted it, I'm sure you will be licking your fingers as well as changing those thoughts. * Basmati Rice usually requires only 1.5 cups of water to a cup of Rice, but I prefer to add a little bit more to compensate for the water lost in steam so that the grains are well done and the rice remains moist. Wash the Basmati Rice and soak in cold water for 15 minutes. Heat oil in a pressure cooker. Add the Bay leaves, cloves, cardamom and cinnamon. Let the oil take on the flavors for a few seconds. Then add the slit green chillies and saute for 30 seconds. Now add the ginger garlic paste and saute until fragrant. Add the thinly sliced onions and saute until translucent. Meanwhile, crack the eggs in a clean small bowl. Using a fork, whisk to break the yolks. Season with 1/4 teaspoon of salt and set aside. Once the onions are done, lower heat and then add the eggs. Scramble them using a wooden spoon. 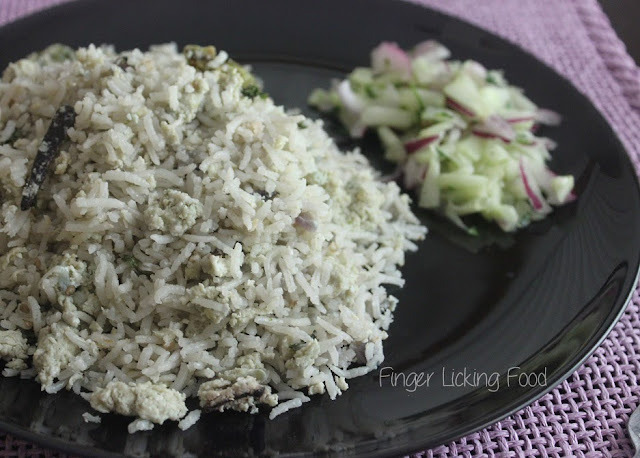 To this add the drained basmati rice and chopped mint leaves. Add water and season with salt to taste. Add the lemon juice and combine well. Turn up heat, cover the pressure cooker with a lid. Wait for the pressure to rise.When it begins to, place the weight on the lid, turn down heat to low and cook for 9-10 minutes. Once done, let the cooker cool slightly, fluff the rice with a fork and serve hot with a refreshing Cucumber & Onion salad. Most Biryanis are made with a variety of spices and hence are usually served with a cool raitha which is yoghurt based. 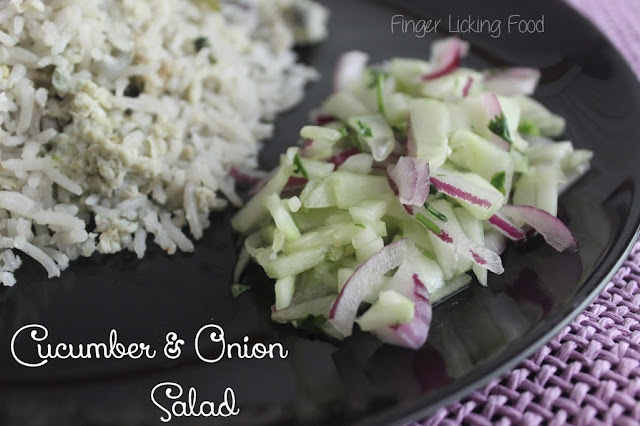 This Biryani doesn't have many spices and is mildly flavored and is paired best with a refreshing and fresh cucumber & onion salad. Combine all of the above in a small bowl and refrigerate for an hour. 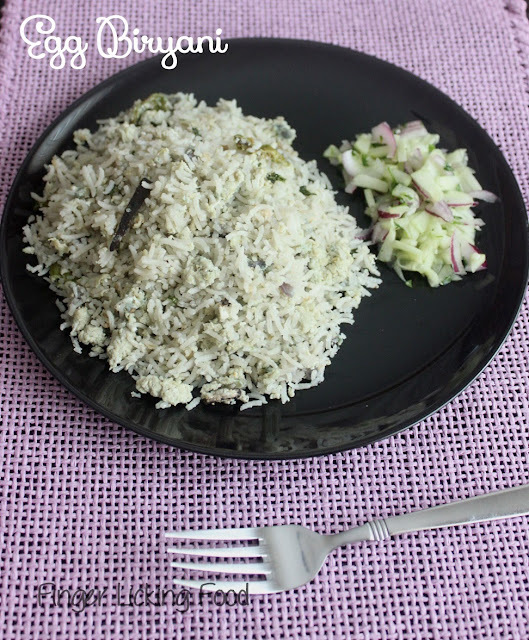 Serve with Egg Biryani. The lemon juice helps break down the onions a little and reduces the pungency. If you like the heat from the raw onions, reduce the quantity of lemon juice.